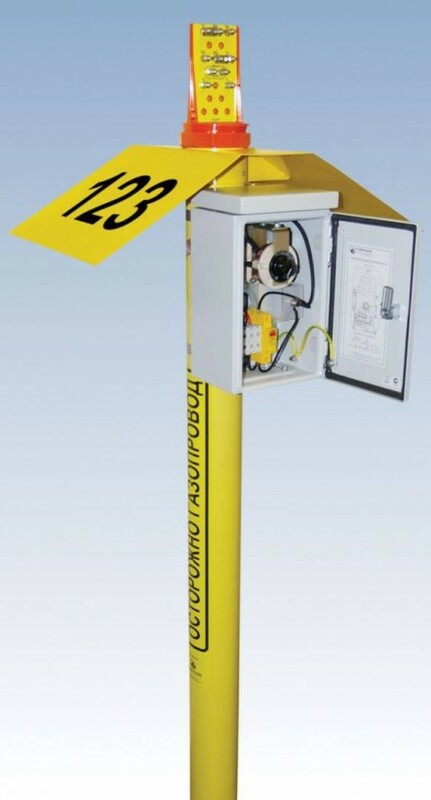 A test station is a terminal block fixed on a post. Additionally completed with a distance mark, which allows to check visually a pipeline route from the air. A post may be made of PVC or metal. The applied materials are intended for outdoors operation in all climatic zones. The post is equipped with an anchor device which prevents test station from free taking out. 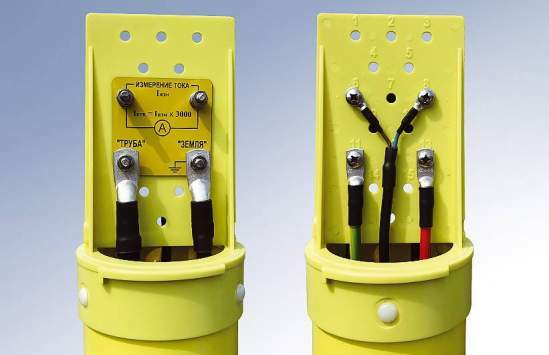 A terminal block is made of polycarbonate and intended for applying up to 18 terminal clamps. The terminal clamps are made of stainless steel or yellow metal. To exclude an illegal access, the terminal block has a cap with a locking device. 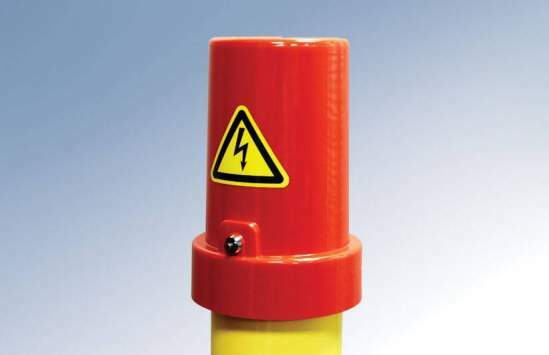 Marking and warning (informational) inscriptions are made on a self-stick film by thermal transfer printing method. To increase the UV radiation resistance of marking signs and labels, an outside lamination with a special protective film is applied. The resistance period of marking and inscriptions is at least 15 years. 6 – electric circuit diagram No in accordance with TS-3435-002-93719333-2009 (it is not specified if cables and other accessories are not ordered,). In case of order with a special electrical connections diagram “SP” must be specified instead of “FxXX” and the diagram should be enclosed as a separate document. In case of applying a VBbShv type armored cable, the diagram number is completed with the “Ar” abbreviation (in other cases – not specified). 8 – distance mark presence (not specified, if absent). 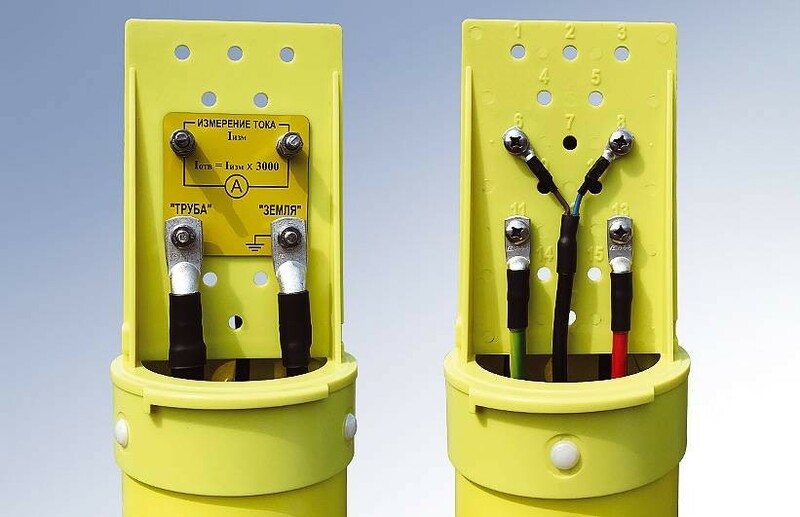 Upon request, test stations are equipped with additional accessories for electrochemical protection of pipelines (reference electrodes, coupons, corrosion rate indicators, etc. ).